A thousand yellow plastic ducks will be thrown into the Menai Strait in ‘The Inaugural Duck Race’, to be held between the bridges on Sunday, 31 August 2014, from 10.30am. "We wanted to create a charity event that was a bit crazy and offered our bathroom buddies a little more adventure. We were inspired by the Raft Run's yellow duck logo. So we thought why not use our fantastic location to race ducks from Britannia Bridge to Thomas Telford’s Menai Bridge? There are great prizes for the "sponsors" of the first three ducks under the bridge and we hope to raise a lot of money for Macmillan Cancer Support," says Phil Scott, RIBRIDE Adventure Boat Tours. The event is in aid of Macmillan Cancer Support, and in support of "The Great Strait Raft Run" and the Menai Seafood Festival, two very successful events in Menai Bridge, with sponsors including RIBRIDE, Dylan’s Restaurant, Benjamin Lee Chocolatier and Engan Creadigol Creative. "We have worked with the Isle of Anglesey County Council to get permissions and we will collect up the ducks at the finish, and the stragglers too. We want to collect all the ducks so we can reuse them next year, when we will hopefully have an even bigger event with more ducks sponsored to take the thrilling journey between the bridges," says Phil. The ducks will be released by the RIBRIDE team from under the Britannia Bridge at 10.30 on Sunday, 31 August. It is hoped that the winning ducks will pass under the Menai Bridge at 12 noon, tide and wind permitting. 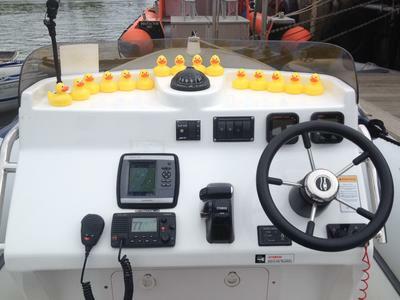 All ducks are numbered and you can sponsor your duck for £2 from the RIBRIDE office at Porth Daniel, St George’s Road, Menai Bridge LL59 5DE. Ducks are available now so just pop into the office. The last chance to sponsor a duck will be at the Menai Seafood Festival on Saturday, 30 August. First prize is a "Book the whole boat" RIBRIDE for an hour (worth £195), second prize is a meal for two with a drink at Dylan’s Restaurant (worth £60) and third prize is a Benjamin Lee chocolate voucher for £20. "You would be quackers to miss out on sponsoring a duck; they are available on a first come, first served basis. Just pop into our office to grab your duck now! With the help of our marvellous supporters, it is great to be fundraising for Macmillan Cancer Support," says Phil. For more local news and stories, subscribe to our free Anglesey newsletter. It's as easy as 1-2-3!